Cut Type & Size: Cross Cut, 1/8" x 1 1/2"
Kobra 400 WB cross cut shredder can shred paper, credit cards, CDs, DVDs, floppy disks, staples and paperclips. 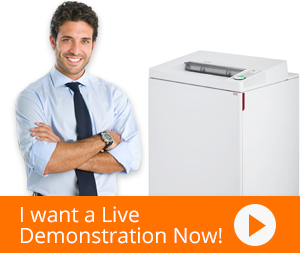 It has a security level of 3; making it suitable to shred less confidential documents. Kobra 400 WB’s design is unique. On the top is a large hopper with a glass door. The user can simply empty the documents to be shredded directly from the waste bin into it. The documents that can be shredded go beyond the basic media of paper. The glass door allows the user to view the level of the documents to be shredded, and in case of over filling, and can open the door and remove some documents. 400 WB industrial shredder also offers the option to manually feed in the documents that need to be shredded. There is a slot in the front through which, the user may feed paper and plastic. The bag can hold 53 gallons of shredded material. Kobra 400 WB shredder features an Automatic Reverse System that prevents paper jams. The “SUPER POTENTIAL POWER UNIT” contains of heavy duty chain drive with steel gears. It also comes with carbon hardened cutting blades.